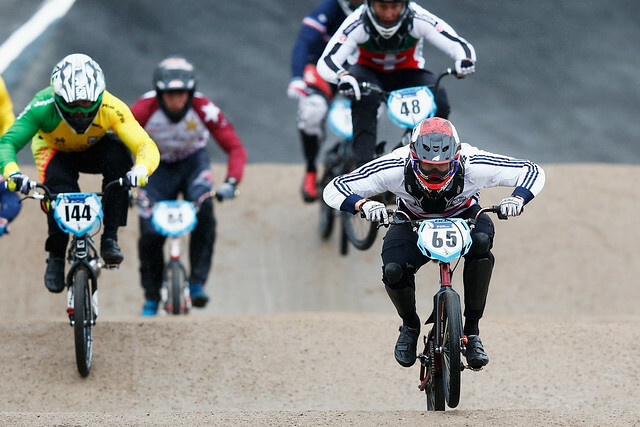 Great Britain Cycling Team’s Liam Phillips fought hard but could not win a second UCI BMX World Championship title in horrendous conditions in Zolder, Belgium. An uncharacteristically slow start in the final cost the 2013 world champion and he finished fifth as wind and rain battered the Zolder circuit and forced the racing programme to be reduced. "I’m really disappointed in the fact that I didn’t have a good start in a world championship final," Phillips said. "I’ve proven over the last few years that I can deliver under those high pressure situations. "I was right there and I felt like that race was there to win, I really did." Dutch rider Niek Kimmann won the rainbow jersey, Jelle van Gorkom silver and David Graf bronze as all categories started on the smaller ramp instead of the eight-metre supercross ramp due to safety concerns. Kyle Evans exited in the quarter-finals after unfortunately unclipping on the opening straight while Tre Whyte and Quillan Isidore went out in the 1/8 finals. Charlotte Green, 21, raced well to reach the semi-finals of the elite women’s event. In the junior men’s category, 16-year-old Paddy Sharrock showed his promise after a strong performance in the time trial on Friday, reaching the semi-final before being cut up on the second corner, a move which effectively ended his race. Appalling rain and wind in the morning forced organisers to cut the racing down and bring the start time forward by one hour, with just one moto heat instead of the normal three making every round into a straight knockout. Conditions worsened as the racing went on with standing water on the track and strong winds making for testing conditions for riders. Phillips had won his three races on route to the final eight but mistimed his start in the final. The 26-year-old fought back but could not contest the medal positions. Venezuelan Stefany Hernandez won gold in the elite women’s event with Australian Caroline Buchanan second and Denmark’s Simone Christensen third. Argentina’s Exequiel Torres claimed the junior men’s title and France’s Axelle Etienne powered to the junior women’s title.